This diagnostic tool features an endoscope that is passed through the nasal cavity to view the larynx before and after the swallow. It allows trained professionals to observe penetration or aspiration of the bolus before or after deglutition, aiding in the diagnosis of oropharyngeal dysphagia. This tool is preferable to a Modified Barium Swallow Study (MBS) for certain patients because it does not expose the patient to radiation, and it also allows the clinician to photograph and video record evaluation findings to aid in diagnostic procedures between different medical professionals. The FEES evaluation will support our referrals to ENTs and provide them with detailed and objective data, as well as support the differential diagnosis of patients we are referring. Our fully trained and certified Speech Language Pathologists will now offer Fiberoptic Endoscopic Evaluation of Swallowing (FEES) for pediatric and adult patients presenting dysphagia (swallowing disorder) and/or feeding disorders. 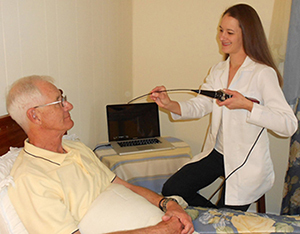 The stroboscopy feature is also useful as an evaluative measure for voice patients. The endoscopic view allows clinicians to observe the integrity of the vocal folds, as well as observe any laryngeal pathology such as vocal fold paralysis or vocal nodules. The objective features of stroboscopy allow clinicians to measure the fundamental frequency (F0) of voice production, as well as observe the vocal folds during phonation. The movement of the velum can also be assessed using this device and may be useful for patients with velopharyngeal insufficiency.